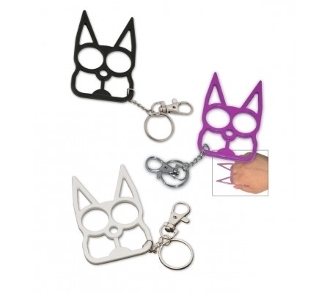 This unique cat defensive keychain packs a sharp punch! The eyes of the cat become finger holes and the ears become spikes when clutched in your hand to create an excellent means of surprise-defense against an attacker. This cat self-defense keychain is a perfect but harmless looking piece of protection. It is your responsibility to determine the legality of this item in your state and for airline travel.